Learn more about our family run farm. 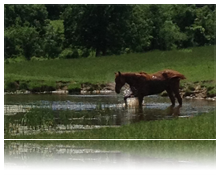 A family owned and run horse retirement farm. 7 Springs Farm has been in our family since 1968, and we're not going anywhere! The farm is our life and we couldn't be happier anywhere else. We are often asked how long we have had the farm, and if we would ever think about moving. The fact is, 7 Springs Farm will always be the Kubitschek family farm! We understand that sending your horses to us is a long term commitment, so we just want to reassure you that we will always be here for them. We began retiring horses here because we knew we had the perfect environment for them: large pastures to graze and stretch their legs in, without a lot of rocks, natural streams and spring fed ponds to drink from, easy rolling hills, and moderate climate (we are not as hot and humid as the south in the summer, and not nearly as snowy and cold as the north in the winter.) 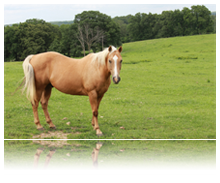 We wanted to help retired horses by giving them a dream home where they can just be a horse! If you are considering retiring your horse with us at 7 Springs Farm, you are giving your friend an amazing gift in return for all of the years they were your riding companion! We raise and put up grass hay, and alfalfa hay right on our farm every year. 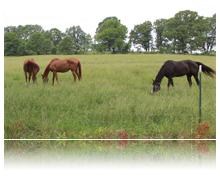 It is ideal for the retired horse, because the hay that they eat is exactly what they are used to grazing on. We put up both round bales and square bales. We feed the square bales in the barn and use them to make our own custom feed mix (see below), and we roll out round bales in the pastures in the winter time. A lot of our retirees don't have the teeth they used to, and so they need extra help with their feed. They might not consume as much grass while grazing, or they might not eat hay so well anymore. That is why we offer our own custom feed mix that has ground up grass hay and alfalfa hay that we raise on our farm, and corn from a local farmer. We know it is good quality hay and feed they are getting, and many retirees do better getting a mash.